"I don't want you to get chopped up into little mother effing pieces. "- FBI detective Sarah Ashburn tells a suspect she's trying to get information out of to catch the actual killer during interrogation in The Heat. "Has anyone seen the captain's ball? "- Detective Shannon Mullins screams through the police department at everyone after she finds out the FBI has taken over her investigation. 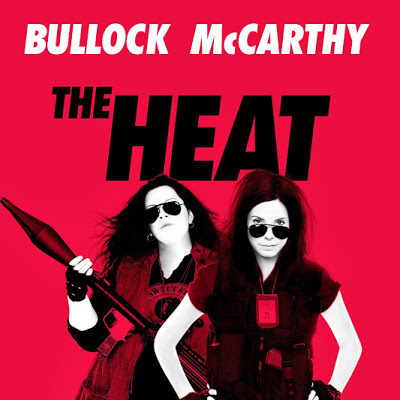 The Heat is about two control freak women cops, played by Sandra Bullock and Melissa McCarthy, who join forces to take down a drug lord. It all starts when FBI detective Ashburn wants a huge promotion, but finds out no one in the office respects her. In order to get the promotion her boss sends her to capture the drug lord. Detective Shannon Mullins, on the other hand, does not respect anyone. She is so mean that her boss lets her do whatever she wants. Her boss even complains that the job has aged him. He looks 60, but is 43. He has a 5 year old that calls him gran-dad. Although he's funny, Mullins is even more hilarious. She's so funny that everyone in the department laughs at her.That is everyone, except Ashburn. Together Mullins and Ashburn get the job done and show everyone why they're great cops. They leave their audience in tears of laughter. From their encounter with suspects such as Spoken Reasons, who played a drug dealer on the street, to meeting an Albino detective who came across as a creep in the club. The Heat also showcased a growing friendship. These two women did not like each other in the beginning, but they grew and look at each other as sisters in the end. The Heat was excellent. It will definitely be added to my movie collection. P.S. And I thought nothing in 2013 could be funnier than Kevin Hart's Let Me Explain.